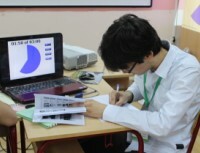 In all Science Fights, the Jury evaluates the Team performances by publicly showing integer scores called Grades or G.
Each Team completes three performances (Reporter, Opponent, and Reviewer) in each Science Fight and earns three Average Points P which are summed up to obtain the Sum of Points SP. In case the Team obtains a Yellow Card, the SP is consequently reduced. The values of SP in each Group are used to calculate the Criterion of Victory V which is set to V=1 for the Team with the highest SP and for one or two Teams which have an SP that differs from the top result by no more than 2 points (SP≥SPmax−2.) For the Teams in the Group which have (SPmax−10)≤SP<(SPmax−2), the Criterion of Victory is set to V=½. For the Teams which have SP<SPmax−10, V=0. The Criterion of Victory is the primary parameter that determines the placing and rank of each Team. 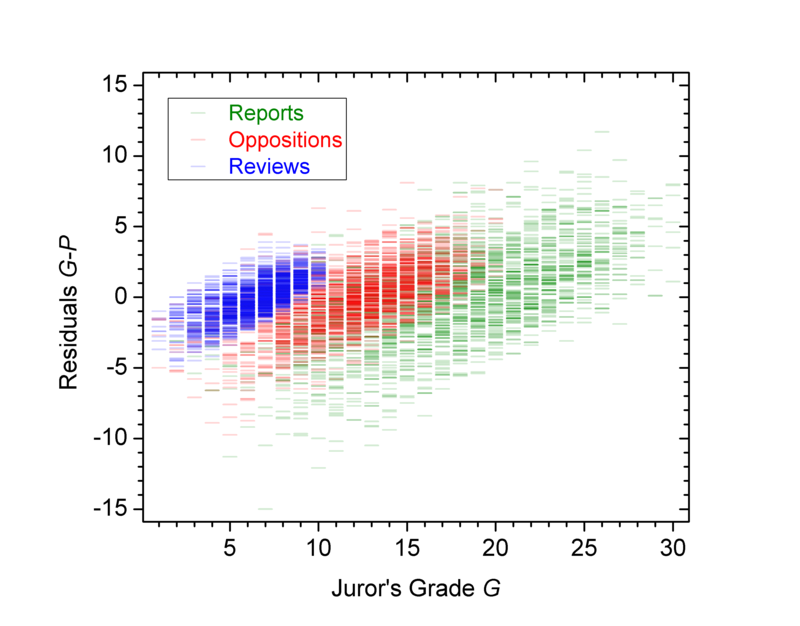 It minimizes effects of statistical noise and Juror-to-Juror differences in grading. During the IYNTs 2013 through 2018 taken together, 8157 Grades were delivered in 375 stages. Each of the 375×3=1125 performances therefore obtained its Grades G from an average of n=7.3 Jurors. A total of 133 round-robin matches (Science Fights in a Group) were played with three or two Teams each. In them, the Teams collected 375 values of SP and 375 values of V.
The spread in the G along the X-axis is broad, indicating that nearly a whole spectrum of available G is used by the Jury, however the extreme G are inherently less frequent. We encourage each Juror to stay centered around 15 points for a Report, around 10 points for an Opposition, and around 5 points for a Review, each time weighting their G against what they believe an average IYNT performance is. 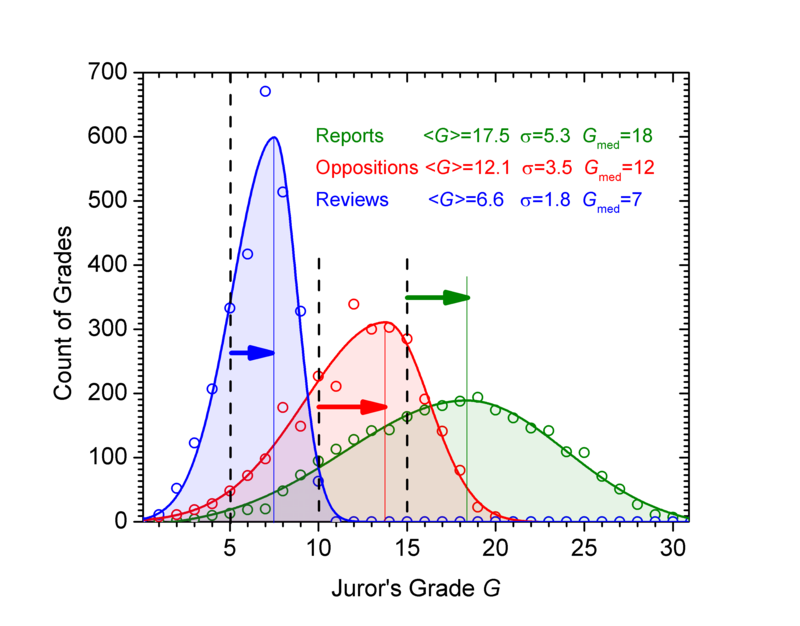 In reality however the actual mean and standard deviation are 17.5±5.3 for a Report, 12.1±3.5 for an Opposition, and 6.6±1.8 for a Review, indicating that an average Juror shifts all their G to the right as compared to our guidelines. The distributions are moderately asymmetric, with the median Grades of 18 for a Report, 12 for an Opposition, and 7 for a Review. In turn, the mean and standard deviation for the Average Points P are 17.5±4.2 for a Report, 12.1±2.8 for an Opposition, and 6.6±1.4 for a Review (raw ASCII data.) Such distributions of P are narrower than the respective distributions of G.
At this point it is important to realize that the IYNT requires a direct comparison of results from parallel Groups, whilst each Team does not play every other Team during one Science Fight. We should therefore be aware of the extent to which parallel boards of Jury can be influenced by fluctuations and what grading parameters are uniformly objective indications of the relative strengths of all IYNT contestants. A consistent grading is extremely important for the IYNT as it must allow reliable identification of winners in each Group and the ultimate winners of the competition. Let us consider three hypothetical and extreme scenarios, Example 1, Example 2, and Example 3. In the Example 1, all Jurors agree with each other and there is high confidence that Average Points P reflect objective differences between the two Teams. For each Juror and each Grade, G−P=0. The Example 2 shows a situation where both Teams obtain equal Grades from the middle of the spectrum. Although it is natural that some games can end in a tie, this scenario is less advantageous. If no Team can impress the Jury or the Jury lacks sensitivity to hidden variances between the Teams, it is difficult to rank all Teams from top to bottom. The Example 3 depicts an undesired event where different Jurors use radically different grading criteria. Team 1 earns 0.1 points more than Team 2, however the level of confidence to this difference is low because σG−P, or the spread in G given to one performance by several Jurors, is much wider than these eventual 0.1 points. Albeit both Average Points P are nearly equal to the pair of P in the Example 2, these two P do not reflect the serious differences between the Teams that each Juror has noticed and highlighted in their grading. 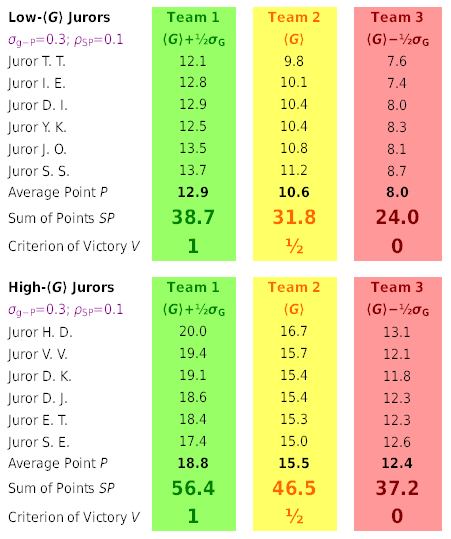 Concluding that Team 1 shows a better performance than Team 2, or either Team in Example 2, is inconsistent with this set of Grades G.
Our aim is that separate Jurors put very similar Grades for one performance, however each Juror puts distinctly different Grades for different performances. During each IYNT, we brief Jurors and Teams on our grading and scoring criteria. Our guidelines have evolved since 2013, and as of now consist of four partial grading criteria. Our aim is to keep the guidelines clear and simple, and make sure that any Juror relies on the fixed, common criteria when evaluating performances across the parallel Groups. The criteria are printed directly on the individual Juror's protocols. 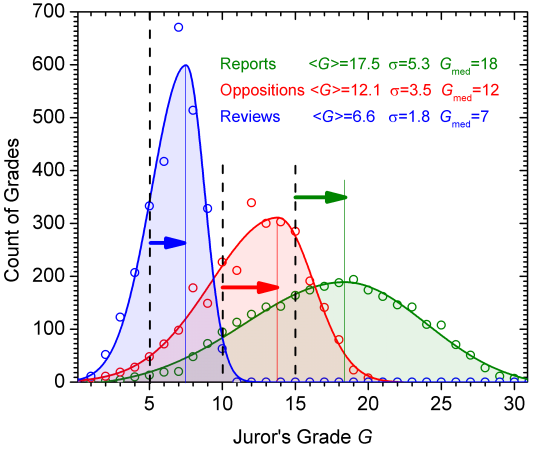 The Jurors are asked to add or subtract points from a starting grade (15, 10, or 5) and decide on their final Grade G. Such a decision is individual, and an upwards of 99.8% performances cause come disagreement in the Grades given by Jurors and a spread of these Grades. No Grade can be corrected retroactively, and each Juror must justify any of their Grades upon the request of Team Captains or the Chairperson. Each G is public. Find below the blank Juror's protocols used at the 6th IYNT 2018, as well as the slides from the most recent introductory briefing for Jurors and Teams. It is now good to look at the real data from all previous IYNTs and analyze the spread in the G given by different Jurors to one performance in one Science Fight. The graph (hi-res image, raw ASCII data) shows each of the 8157 Grades G given during all previous IYNTs. X-coordinate indicates which of the 30 possible Grades G was given. Y-coordinate indicates the difference between this particular G and the Average Point P that was calculated on its basis. To interpret the spread in the Y-axis, one should remember that if Example 1 would take place in each IYNT Stage, each G would be equal to its respective P, and G−P would globally collapse to zero. Luckily, the IYNT is not a paper-and-pencil exam, and its Jurors have opinions which result in a distribution of individual G around the P in each Stage. Despite being statistically improbable, extreme G−P occur at the IYNT. 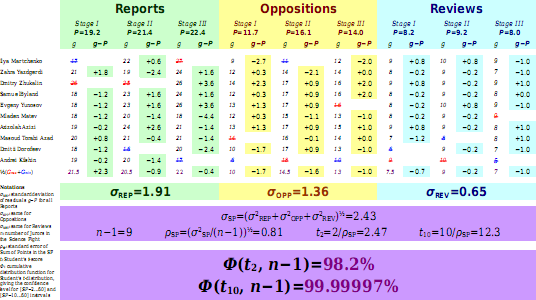 The table below reflects each of the ten rare events wherein G−P was equal or exceeded 10 points in absolute value. The standard deviations of the distributions of G−P for the three types of performances are found as follows: 3.19 for a Report, 2.17 for an Opposition, and 1.22 for a Review. These particular values are calculated with two extreme G in each Group taken with the weight of 1, rather than ½. Since the extreme G contribute to statistics of P with the weight of ½, we can prepare the working dataset of 8157−3×375=7032 processed grades that we label g (raw ASCII data for 2013, 2014, 2015, 2016, and 2017.) g=G if the respective G is not extreme in the Group, and g=½(Gmax+Gmin) for the pairs of extreme Gmax and Gmin in each Group. The statistical parameters of the distributions of residuals g−P now provide crucial information on the statistical significance of each P, and in turn SP, and the IYNT rankings. In case the SF results do not permit rejecting the null hypothesis that a slightly higher SP in a round-robin Science Fight is observed by chance, more than one Team earns V=1. The Sum of Victories SV keeps track of such statistically significant cases wherin one or several SF winners step forward. We can define the significance of V=1 as the level of statistical confidence for the interval [SP−2...60] in one Science Fight Group. This statistical significance depends only on the values of g−P and number of Jurors n in the Group, and does not directly depend on the absolute magnitudes of G. This has the advantage of placing focus on congruence between opinions of Jurors, rather than ranking of Teams. The standard deviations σ of the distributions of g−P for each of three types of performances in this SF are found as follows: σREP=1.91 for a Report, σOPP=1.36 for an Opposition, and σREV=0.65 for a Review (each from a sample of 27 residuals g−P.) As per the IYNT procedure, SP is calculated as a sum of Average Points P for these three performances. By assuming σ2SP=σ2REP+σ2OPP+σ2REV, we can easily find σSP=2.43 in these Finals of the 4th IYNT. It is now easy to determine the root-mean-square deviation ρSP by defining ρ2SP=σ2SP/(n−1), where number of Jurors is n=10. The value of ρSP=0.81 evaluates the standard error of the mean, i.e. the statistical uncertainty of SP earned by any Team in the SF. This standard error is inherent in estimating whatever true value of SP from limited statistics. If the difference between any two sample-based SPi and SPj is comparable to or less than ρSP, they can be assumed statistically indistinguishable. In the next step, we can find the confidence level for interval [SP−2...60] as a function of the number of degrees of freedom in a representative sample (i.e. n−1) and Student's t-score (i.e. 2/ρSP.) This is based on assuming that Student's t-distribution is a valid approximation. The Table below summarizes the paramateres calculated in the similar manner for all 133 round-robin Science Fights of past six IYNTs. We cordially acknowledge Dmitriy Baranov for his help in processing the data. Click on the headers to have the table sorted by any desired parameter. In a typical Science Fight, earning a V=½ or above is a four-sigma event, with an expected confidence level of (99.98±0.04)% for the interval [SP−10...60]. Earning a much more rewarding V=1 is a two-sigma event, with an expected confidence level of (95±4)% for the interval [SP−2...60]. Earning each V is a statistically independent event, and earning several V=1 further contributes to the confidence in the placing of top IYNT Teams. These results justify the importance of the Criterion of Victory V and importance of the fact that no IYNT Stage has ever been graded by less than 5 Jurors. As argued below, besides having different opinions, individual Jurors may also work on different grading scales. At all times, when looking at the IYNT scores, we ask whether their difference is representative of a real difference between Teams or whether it is a statistical fluke. An especially high level of significance is demanded if grading parameters are used to resolve the placing of eventual Semi-Finalists and Finalists. By assuming that the grading parameters of Jurors would not improve considerably before the 7th IYNT 2019, we may estimate the average expected level of confidence for [SP−2...60] as a function of the number of Jurors n randomly selected to one Group. To do so, we can re-calculate ρSP from a historically global σSP. For reference purposes, this table summarizes the individual grading parameters (within one IYNT) of all existing 170 Jurors. We cordially acknowledge Dmitriy Baranov and Hieorhi Liaśnieŭski for their help in processing the data. The presented parameters give a glimpse of the Jurors' perceptions of the grading scale in the IYNT. Click on the headers to have the table sorted by any desired parameter. κ is standard deviation of all delivered Grades corrected for the average Grade ⟨G⟩ via κ=σG−0.40825×⟨G⟩; κ reflects relative width of the spectrum of Grades used by the Juror and can be more suitable for comparison of Jurors with distinctly different ⟨G⟩; note that κ is linearly proportional to the relative value of σG/⟨G⟩. The names are initially sorted by number of IYNTs judged, then by κ, then by ⟨G⟩. Click on the headers to have the table sorted by any desired parameter. There is a complex interplay between each of the calculated parameters, and some of the crucial parameters depend not only on what G each Juror gives, but also on what G other Jurors in the same Group give. Other parameters depend on the lot, tournament brackets, or appointing decisions of the General Council, and are beyond control of the individual Juror. Persisting regularities seen for Jurors who worked at more that one IYNT suggest that any shifts in σG or ⟨G⟩, observed consistently in several Jurors, may reflect objective differences between separate IYNTs, viz. in diversity or average strength of participants. Particular grading preferences for a Juror are sometimes clearly recognizable in separate IYNTs and not obscured by limited statistics. These differences in particular explain why Jurors and Teams rotate between the Groups, and V is a more representative derivative grading parameter than SP. at the same time, is balanced to have a moderate σG−P, with preferably σG−P<3. These three goals can naturally clash with each other. At this point it is important to realize that each Juror must be focused only on assessing immediate performances and sticking to uniform, scientific, merit-based grading criteria, and that furthermore each G must be given independently. To illustrate the potential consequences of the spread in these grading parameters, let us consider a Gedankenexperiment with three Teams competing in one Science Fight. Team 1 shows a relatively strong performance and receives the Grades which sit on the upper end of the [⟨G⟩−½σG…⟨G⟩+½σG] interval. In other words, should G be distributed normally for each selected Juror, the performances of Team 1 would be better than Ф(⟨G⟩+½σG)=0.69 of all performances the Juror grades in the IYNT. Such a Team would potentially end up as a Finalist. Team 2 shows an average performance and receives average Grades ⟨G⟩ from each Juror. Team 3 shows a relatively weak performance and receives the Grades which sit on the lower end of the [⟨G⟩−½σG…⟨G⟩+½σG] interval. In other words, their performances are weaker than very approximately Ф=0.69 of all IYNT performances graded by the Juror. Such a Team would potentially not qualify for Semi-Finals. These three Teams are graded simultaneously by two boards of selected Jurors. One board is composed of six Jurors with some of the lowest observed ⟨G⟩, while the other board is composed of six Jurors with some of the highest observed ⟨G⟩. It is easy to determine the results of this hypothetical Science Fight because ⟨G⟩ and σG are publicly known for each Juror. These results illustrate the level of tolerance of the Criterion of Victory V and Sum of Points SP to the most severe effects of improbably unbalanced boards of Jurors. 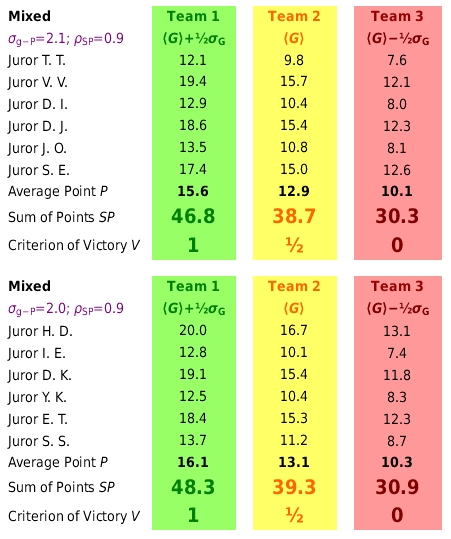 As seen from this calculation, the strong Team 1 graded by low-⟨G⟩ Jurors obtains less points than the average Team 2 graded by high-⟨G⟩ Jurors and ties with the weak Team 3. The weak Team 3 graded by high-⟨G⟩ Jurors, respectively, earns more points than the average Team 2 graded by low-⟨G⟩ Jurors. An artificial selection of Jurors in this test leads to unrealistically small σg−P and ρSP in both boards of Jurors. There is however no negative effect on the Criterion of Victory V and consequently the results of the Science Fight. In the next Gedankenexperiment, let us rotate and evenly distribute the same Jurors as routinely made before each real Science Fight. 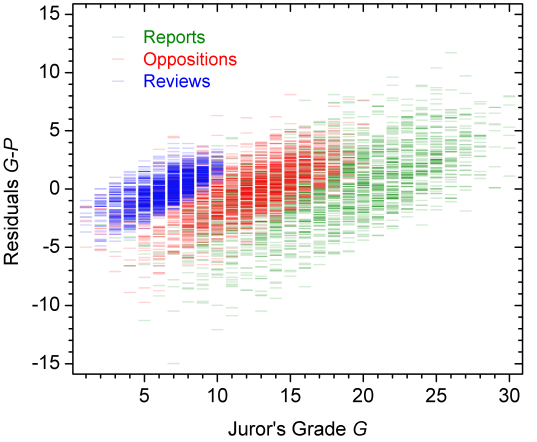 Though the Jurors give the same Grades G as in the first experiment, their balanced distribution now mitigates the effects on SP of Juror-to-Juror differences in grading. Note that this happens at the cost of increased σg−P and ρSP, which both now fall in the range of typical IYNT values despite an articifial, bimodal distribution of ⟨G⟩. Although we cannot generalize from one example, the respective Sums of Points SP from both boards of Jurors now differ by only 1.5, 0.6, and 0.6 points. In this extreme value analysis, we test a statistically improbable scenario which would have some of the worst impacts on the stability of Science Fight results. We test extreme values of ⟨G⟩ and the most unrealistic distribution of Jurors, and observe the amplitude of fluctuations in SP which always fall within a 2 points threshold. The table below provides an overview of statistical parameters for the Grades given by all Jurors within one IYNT, and the overall statistics for all four IYNTs. V=½ is the mean and standard deviation of the confidence levels for the interval [SP−10...60] in all SFs. By comparing sSV4 with sTSP4, we can see that the Criterion of Victory prevents a melting pot effect in TSP where Total Sums of Points can converge to rather similar values for many Teams. Teams and Jurors alike rapidly learn from SF to SF. One may argue that the Teams may start showing less diverge performances, or the Jurors may start giving less diverge Grades G.
Confidence levels for the interval [SP−2...60] in each SF, as well as distributions of G, G−P, and SP, are of interest to assess the importance of these effects. Overall, the presented results define the extent to which the results of single paired comparisons of SP are not yet obscured by statistical noise. With the available data, we can conclude that the IYNT procedures and in particular the Criterion of Victory V alleviate Group-to-Group and Juror-to-Juror scaling differences, and allow separation of each Team in the IYNT with a two-sigma significance threshold. Click on the headers to have the table sorted by any desired parameter. The Teams are initially sorted by Criterion of Victory in the Finals (VF), then by Sum of Points in the Finals (SPF), then by Criterion of Victory in the Semi-Finals (VsF), then by Sum of Points in the Semi-Finals (SPsF), then by Sum of Victories after Selective SF 4 (SV4), then by Total Sum of Points after Selective SF 4 (TSP4). Final Rank (RF) and the type of Medal (M) reflect the results of each IYNT according to the regulations valid at the time. Each Science Fight Group is staffed with a trained SF Attendant who records the displayed Grades in a separate Science Fight Protocol and also operates the Clock. Prior to announcing their Grades, each Juror fills and signs an individual protocol which is checked by the Chairperson. All Jurors then simultaneously hold up cards for their scores, and the Chairperson reads the Grades G aloud in a determined order. The Chairpersons and Attendants finally cross-check the Science Fight Protocol against the Jurors' original protocols. All protocols are scanned and available for download from the webpages of each respective IYNT. A unique residual G−P=−15 was recorded in 2015-F-A-II-Rep (June 24, 2015.) This surpassed the record of G−P=11.7 in 2015-1-A-III-Rep on June 20, 2015, the earliest of 10 instances of G−P equal or exceeding 10 points in absolute value. The only two performances that have resulted in all Jurors in the Group giving equal Grades were 2013-4-B-II-Rep and 2013-4-B-II-Rev (May 3, 2013.) While each such instance was improbable per se, both of them occurred in the same Science Fight Group with the same five Jurors.